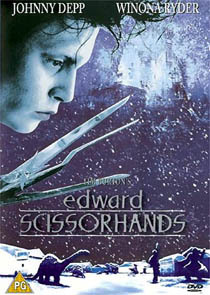 A young man with knives and scissors for hands is let loose into the community. Tim Burton’s wonderful fairy tale has been released in a version that closely mimics the wonderful 10th Anniversary Edition released in the US, (the UK disc is more modestly announced as a Special Edition on a little sticker!). The film looks stunning, with appropriately vibrant colours. The film is presented in its original theatrical ratio (1.85:1, 16:9 enhanced), masking off picture information on the full-screen versions which was definitely never meant to be seen. The UK disc contains the same extra features as the American version: a director’s commentary; a commentary by Danny Elfman, interlaced with the isolated score (one of the composer’s best); an ugly-looking five-minute promotional piece featuring cast interviews and some precious seconds of behind-the-scenes footage; trailers and TV adverts; a few pages of concept art and a collection of sound-bites seemingly culled straight from the film’s Electronic Press Kit. The US disc, however, is preferable: the US version has more elaborate animated menus and a higher audio bit rate (448kbps on the Region 1 disc, 384kbps on the Region 2 version). The deciding factor, though, must surely be the fifteen-second cut made by the BBFC, which severely reduces a beating that Edward receives at the hands of his nemesis.